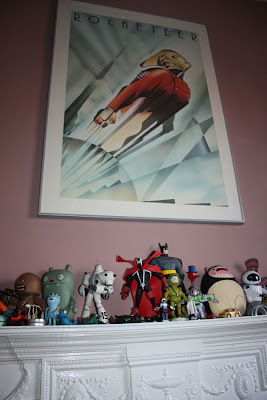 Continuing the photo's from around the studio here is a pic of Mr Pauls collectables. If you see photo's from inside animation studios you always see a mass collection of merchandise and toys. Not a lot of that here as we never get anything for free (sad face). So we have to collect things by ourselves. So here is Mr Paul's shelf in his room. It is much more impressive than mine. (jealous face). Actually I've only bought about half of those figures myself. The rest have been gifts over the years. I have no problem being called a nerd.